CONTRIBUTORS: Steinhilber, F., J. Beer, and C. Fröhlich. 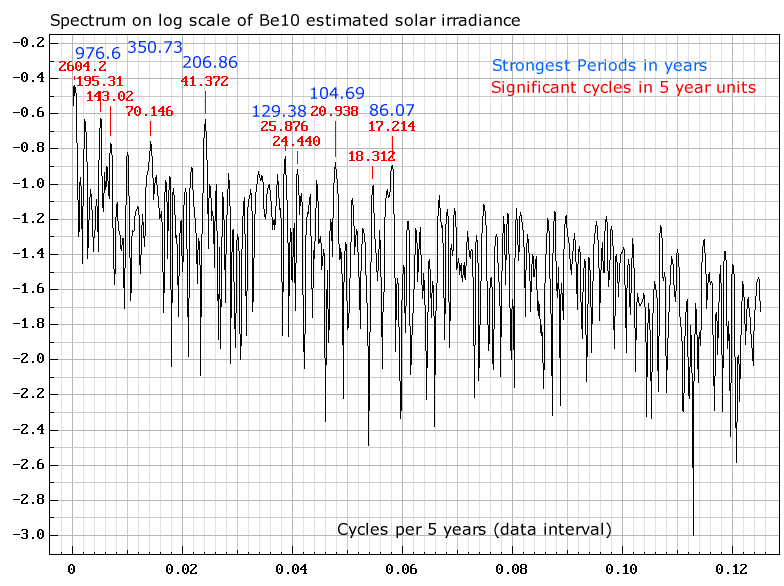 Some of the strong cycles periods found are very similar to those found in the C14 reconstruction, 351 years (352), 207 years (208), 104.7 years (104.3), 86.1 years (87.6 and 84.7). Some cycles are similar but no longer significant (around 500 years). The very long cycles are not confirmed, but remember that the time interval used here is a bit shorter. 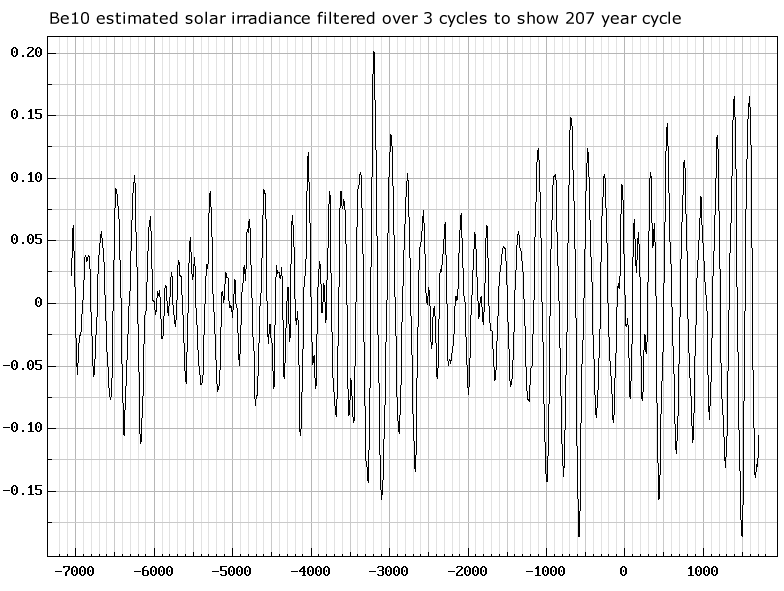 Because the 207 year cycle is very strong, it is once again examined by use of a 3 cycle filter. 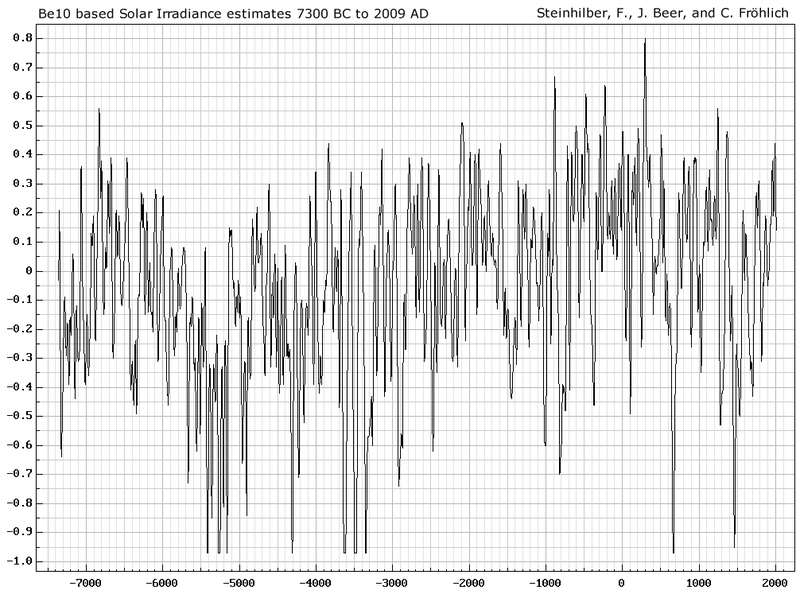 Just as in the case of the 208 year cycle in the C14 solar proxy, we have peaks occurring at around 1800 and 2000 and troughs at around 1700 and 1900. This clearly shows that the Sun was a contributing factor to temperature rises in the 20th century, and that its contribution for the next century will be towards cooling. Graphs and analysis prepared using CATS. This entry was posted in climate-Solar, cycles-Analysis, software-CATS and tagged .solar, 207 year, Be10, C14, irradiance, proxy, sun. Bookmark the permalink. Ray, thanks for this excellent analysis. The peak at 976 years coincides with P.A. Semi’s calculation for the cycle of the internal distribution of angular momentum in the solar system. The 350 year peak is around twice the Hose cycle, which is once again missing, which supports your contention that Hose miscalculated. Please tell us more about that and your interaction with Landscheidt. When I spoke at FSC (Foundation for the study of Cycles) conference in about 1990, I mentioned that Fairbridge 179 year cycle is really 171 years on average. I described what I called “specific occurrences” of cycles of 179 and 159 years for J-S-U-N alignments and stated that the average was 171 years. Landscheidt was very vocal in sating that I was wrong, even after I explained to him that every 179 years U and N get 8 years apart, so that after 10 cycles they are totally wrong unless you insert some 159 year periods which are evident in Fairbridges graphs. Fairbridge was present and I think that he understood. Years later, I mentioned all this on the Landscheidt site, and the guy that runs that agreed with me about this. Ray, great stuff, thanks for the refresher on the Hose cycle problem. So you met Rhodes too. Wish I’d had that pleasure. Tim’s analysis is very promising. I’m going to take a look at the CATS software soon and see what I can do with it.